AS we enter round three of the TAC Cup Girls, we are beginning to see the ladder take shape. 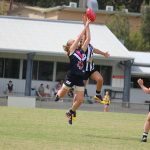 There are four undefeated sides – Northern Knights, Geelong Falcons, Eastern Ranges and Murray Bushrangers – while four sides – GWV Rebels, Dandenong Stingrays, Western Jets and Calder Cannons – are yet to taste victory; at least one of which will do so, with the Jets and Cannons clashing on Sunday. The Greater Western Victoria (GWV) Rebels head into their clash with Bendigo Pioneers yet to taste victory after a tough couple of matches against Eastern Ranges and Geelong Falcons. Now back at their home stadium, the Rebels will look to take full advantage of their familiar blustery conditions to knock off Bendigo and claim the win. Georgia Clarke will start at centre-half back, possibly to curb the influence of Kate Douglass who was impressive for the Pioneers last week. Rebels captain Lauren Butler could go head-to-head with Kodi Jacques, while Sophie Molan will face off against Pioneers captain Megan Williamson in the middle. Bendigo will be keen to bounce back from its loss to Murray, kicking the last three goals of the game but still going down to one of the benchmark teams this season. If they can carry their form into the round three game, they are every chance to get the result. Sophie Kerridge will line up at full-forward alongside Maeve Tupper, while possibly opposed to Georgia Pidgeon and Nekaela Butler respectively. Without the classy Sophie Van De Heuvel in the Rebels midfield, the Pioneers will look to take control and assert themselves through the corridor. Murray Bushrangers are running hot at the moment and will look to use their experience against the young Gippsland Power side. One of the most exciting battles of the day has to be Rebecca Webster going head-to-head with Tyla Hanks. Both players are among the top echelon in the competition and have been in super form this season. Up forward, the dangerous pocket rocket Julia Harvey or teammate Claudia McKimmie could have Power defender Emily Haeusler stand them, all three of whom are in good form. Eloise Ashley-Cooper and Grace Egan represent some pretty potent half-back flankers and Holly Andrews and Nikia Webber will be looking to quell their influence. Julia Redmond has been a rock in defence, but she will be tested against Sophie Damon or Olivia Barber this weekend. Murray will head into the match as strong favourites, but with nothing to lose and plenty of speed, Gippsland has every chance of taking it up to one of the top sides in the competition. In the battle of the winless teams, Western and Calder will look to kick-start their 2018 campaign on Sunday. Western have been drawn as the “home” team given the fixture was originally scheduled for Avalon Airport Oval, but a late change to RAMS Arena hands the Cannons the homeground advantage. On the field, Isabella Pritchard and Katarina Rebuffo form a strong defensive duo, while Isabella Grant and Cleo Saxon-Jones are among the targets up forward for the Jets. Through the midfield, Olivia Forsythe and Elizabeth Georgostathis will be hoping to continue their form from last round against a strong Cannons midfield. For the Cannons, all eyes will be on Madison Prespakis through the midfield as the star playmaker in the team. Down back, Molly Warburton and Eleanor Cornish will combine to provide some drive off half-back, while Georgia Patrikios is a skilful player in the forward half. With the likes of Faith Holloway and Felicity Theodore coming off the bench, the Cannons will have plenty of youthful run in the side. The unbeaten Geelong Falcons welcome the determined Dandenong Stingrays to Deakin University on Sunday morning. The Falcons midfield which includes guns Olivia Purcell and Nina Morrison will go head-to-head with the lines of Jordyn Allen and Isabella Shannon, while Lucy McEvoy will have the job on dangerous Stingrays forward Samantha Ryan. Shelley Heath is another nimble Stingrays player who might face off against the Falcons’ Demby Taylor. Brooke Struylaart will go forward for the Stingrays, while Lucinda Cripps will hold down the fort – and for her sake hopefully Sachi DeGiacomi, with the Geelong Falcons centre-half forward in ripping form. Samantha Atkins and Molly McDonald played well last week and might go head-to-head in what should be a fascinating contest. The Falcons will naturally be favourites heading into the clash, but the Stingrays are strong defensively and will be hoping to nullify some of Geelong’s key ball winners. In arguably the match of the round, the unbeaten Northern Knights take on the impressive Sandringham Dragons. The Dragons bounced back from a round one loss to Geelong Falcons, to run all over Oakleigh Chargers last week. The rebound off half-back from the likes of Winnie Laing, Sarah Hartwig and Eleanor Brown was telling, while Eliza McNamara and Abbie McKay were prime movers in the middle. Up forward, Laura Amelung and Sophia Rothfield could be dangerous, but the Dragons key to scoring lies in their ability to share the goals around. For the Knights, they have one of the most potent forward lines in the league, with leading goal kicker Alyssa Bannan alongside other goal kickers Abigail Bennett, Alex Pronesti and Olivia Dikranis. Through the midfield, Nell Morris-Dalton, Maddy Bracantisano and Gabby Newton will look to take control, while Magdelene Antypas and Britney Gutknecht are other names to look out for. The battle in the ruck between Knight Neve O’Connor and Dragon Alanna Dalley will be another fantastic battle. In the final game of the round, Oakleigh Chargers will test themselves against Eastern Ranges at RAMS Arena. Oakleigh has some fantastic ball winners – lead by the classy Gemma Lagioia – and some huge inclusions for the clash, with Katie Lynch – who missed the round two loss – returning, as is Isabella Gietzmann, the dual sports athlete who has returned from cricket season. The forward line for the Chargers looks more potent with captain Hannah McLaren down at full-forward, while Melanie Bertuna will play off a flank. A big omission is that of goal sneak Daisy Bateman, who was quiet last week after starring in round one. Jasmine D’Amato, Nicola Xenos and Emily Harley are other players who have impressed so far this season. For Eastern, it is harder to find a line without a star than one with it. Georgia Macpherson, Charlotte Wilson and Lauren Szigeti provide plenty of rebound, Laura McClelland, Tahlia Merrett and Emerson Woods will be a damaging half-forward set-up, while the speed machines in Mikala Cann and Olivia Meagher will look to outrun the Chargers midfield. An interesting head-to-head will be that of rucks Sarah Kendall and Bridie Winbanks, with both smart players when it comes to positioning at stoppages. ROUND two saw a new ladder-leader emerge, a drought-breaking victory and a winning streak kept intact. 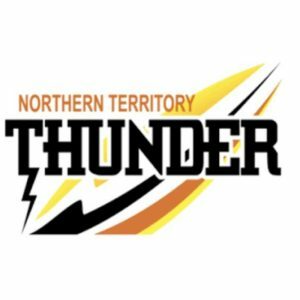 The Northern Knights recorded a 48-point win over the Cannons and soared to the top of the ladder. Over at Casey Fields, the Power came home with their first win in the TAC Cup Girls Competition, after beating the Western Jets by 15 points. The Bushrangers are used to this winning feeling, and experienced it on Saturday against Bendigo to remain undefeated in the TAC Cup Girls Competition. Eastern Ranges reaffirmed their status as a serious TAC Cup Girls premiership contender following an impressive 39-point win over Dandenong Stingrays at Healesville Sporting Complex on the weekend. The home side started strongly in the first quarter, with a 24-point lead heading into quarter time courtesy of two goals to Laura McClelland. The Ranges kept the Stingrays to one goal in the second quarter, and held a 32-point lead heading into half-time. In a sluggish third quarter, The Ranges were able to extend their lead to 37 points at three quarter time, led by Olivia Meagher. 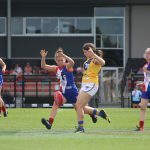 Mikaela Cann received a fortunate bounce on her kick at goal seconds before the siren in the last quarter, as the Eastern Ranges ran out 39-point winners over the Dandenong Stingrays. 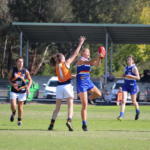 Georgia Macpherson was simply sensational for Eastern Ranges, rebounding everything and creating plenty of drive off half-back which earned her the title of AFL Draft Central TAC Cup Girls Player of the Week for round two. Tarni Brown, the daughter of Collingwood legend Gavin and sister of current Magpies Callum and Tyler, was also impressive, as was Sarah Kendall and Cann who continued their good form from round one. 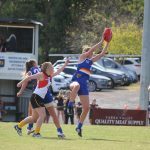 For the Stingrays, Samantha Allen bounced back from a quiet outing in round one to be an important target up forward, while Jordyn Allen played her captain’s role down back and through the midfield. Many of the Stingrays were well held in the first half, but the likes of Allen and Shelley Heath came alive in the second half, while Isabella Shannon was another player who stood out with her classy ball use. Lucinda Cripps was a rock in defence, particularly in slowing the Eastern attack in the second half. Sandringham Dragons bounced back from a round one loss to the Geelong Falcons to record a big 33-point victory over ladder-leaders, Oakleigh Chargers. The Chargers gained top spot after a thumping win over Gippsland Power, but despite a good defensive first quarter, were eventually knocked off by the Dragons who relentlessly attacked for three quarters, booting six goals in the second and third term, while Daisy Bateman‘s sole major for Oakleigh came in the third quarter. There was no shortage of contributors for Sandringham in the win, but it was hard to look past the superb half-back line, led by Sarah Hartwig and ably assisted by Eleanor Brown and Winnie Laing, both of whom also gained vital midfield minutes. The trio provided drive off half-back and caused headaches for Oakleigh, while Eliza McNamara was crucial in the midfield. Famous surnames Alice Burke and Abbie McKay were also key contributors in the Dragons’ victory. Oakleigh might have had a down week compared to the previous round, but Gemma Lagioia‘s class still shone through, while Jasmine D’Amato, Nicola Xenos and Hannah McLaren were also amongst the best. The Chargers worked hard through midfield but struggled to penetrate the impressive Dragons defence. However their own defence held up well on transition, and they will back themselves to beat quite a few teams with their defensive efforts on the weekend. After a huge win over reigning premiers Calder Cannons last round, Murray Bushrangers continued their strong form into round two with a 40-point victory over Bendigo Pioneers. The Pioneers were fresh off an equally impressive win over Western Jets, but with a bottom-age dominant squad, were beaten by the more experienced and polished side. A positive to come out of the game was the continued good form of Kodi Jacques, while outscoring the Bushrangers three goals to zero in the final term. For Murray, Rebecca Webster starred again through the midfield, while Eloise-Ashley Cooper was important in defence. Claudia McKimmie was the target up forward, finishing with three goals, while last week’s heroes Sophie Damon and Julia Harvey were among the single goal kickers. Tahli Verhoeven and Amy Duguid were others that impressed in the Bushrangers victory. For the Pioneers, aside from the consistent Jacques, Megan Williamson and Carly Isaac were named in the best, while Kate Douglass and Sophie Kerridge booted final-quarter goals along with Jacques. Bendigo will be buoyed by its final quarter stand and hope to carry its form into round three next weekend. After going six games, one season and a round without a win, Gippsland Power broke its winless drought with a 15-point win over Western Jets. The win meant the Jets are the only side without a victory, but given they held the Power goalless in the final three quarters, their defensive structures are sure to see their first victory in the near future. The Power booted all of their five goals in the first term and then held on as the Jets tried to force their way in front. A huge gale caused issues for the players when kicking for goal, and often resulted in the defenders of both sides having an advantage. Gippsland’s star midfielder Tyla Hanks put in another polished performance, with the co-captain leading the way along with defender/midfielder Emily Hauesler, and ruck/forward duo Jazz Ferguson and co-captain Amy Dunn. The Power also had plenty of other contributors throughout the day, and celebrated in style after the final siren with the win a long time coming. They will look to build on the victory going forward, with the Murray Bushrangers confronting them next week. Western Jets’ defender Isabella Pritchard again stood out down back, teaming up with Katrina Rebuffo to repel the Power’s attacks. In the midfield, Elizabeth Georgiostathis, Olivia Forsythe and Maddison-Eve Fenech were crucial, while down forward, Isabella Grant continually provided an option roaming up the ground, while Cleo Saxon-Jones stayed closer to home, booting two goals. Geelong Falcons remain unbeaten after defeating the Greater Western Victoria (GWV) Rebels by 39 points in Sebastopol. The windy conditions on the day were not conducive to effective kicking, as balls kicked into the wind fell short, and many kicks on the outer side of the ground ended up out of bounds. The forward pressure, especially in the second half by the Falcons was excellent. Also on the few occasions GWV did end up deep in attack, the Falcons defenders’ pressure and work ethic was excellent, repelling the Rebels’ forward thrusts, thus keeping them goalless. In a lop-sided contest, the majority of the best players were from the winning Falcons unit, and of these, Olivia Purcell was best afield. Her pace at the ball and ability to run and carry was a standout, and she also kicked a major late in the second quarter. Samantha Atkins and Nina Morrison both collected plenty of ball across the half-forward line and were dangerous any time they had the ball in their hands, plus Atkins’ tackling pressure was also excellent. Up forward, Sachi DeGiacomi delivered two goals, kicking accurately in the process, and Renee Tierney also added two majors while also providing plenty of forward pressure. Also noteworthy was the Falcons’ defence as a unit, but Abbey Chapman did an excellent job on her own merit as well. For the Rebels, Ella Wood hunted the ball well early on, although she did fade out of the game as the Falcons took control. Nyakoat Dojiok showed plenty of run, backing herself to take on opponents, but at times struggled to hit targets with her kicking. Sophie Molan was certainly one of the Rebels’ best, and she tried all afternoon, while Lauren Butler and Georgia Clarke also did some nice things. A low-scoring first quarter set up an appetizing contest at RAMS Arena. Madison Prespakis got off to an electric start, despite being targeted by the Knights midfielders. The Calder captain took everything that came her way, and showed her strength in the contest. She was able to penetrate the ball inside 50, but the Cannons forwards just could not get on the end of her kicks, ending up scoreless for the first term. From then on, the Knights got on a roll, with Ciara Fitzgerald doing everything right around the contest. Like Prespakis’ heroics in the first quarter, she too was able to penetrate the ball forward with her big kick. She was complemented by Abigail Bennett who was everywhere on the day. Bennett used the ball extremely well both by hand and by foot, and did some fantastic work around the middle of the ground, winning a lot of the footy for her teammates. Gabby Newton was also a stand-out, winning the ruck battle convincingly and booming the ball out of the centre for the Knights’ small forwards to run onto. She was a strong presence around the contest. Nell Morris-Dalton and Jess Fitzgerald also contributed solid performances in the Northern Knights’ 48-point win. Morris-Dalton flexed her muscles and showed her strength through the contest with a couple of hard-hitting tackles and big, long kicks. Fitzgerald was proactive in all areas of the ground, and impressed with a centre clearance where she burst through a host of potent Cannons midfielders to boot the ball forward. One of these midfielders was Grace Dicker, who impressed with her electric speed and acceleration, and showed some good signs for the Cannons on the day. AFTER a week off due to TAC Cup testing, the TAC Cup Girls are set to run out for round two of the competition this weekend. There are expected to be a number of tight contests this weekend as sides try and either consolidate or turnaround the form from the first week. Each week we will preview the upcoming games and name some players you might like to keep an eye out for. The first game of the round is expected to be a cracker, with Eastern Ranges taking on Dandenong stingrays in the first of a double-header at the Healesville Sporting Complex. In round one, Eastern enjoyed a strong victory over the GWV Rebels, while Dandenong took it up to the Northern Knights for three quarters, before an Alyssa Bannan inspired Knights’ outfit overran the Stingrays. Georgia Macpherson will look to continue her round one form from the back half, as will fellow AFLW Academy member, Emerson Woods in the midfield. Tarni Brown was an excitement machine at half-forward and could cause some headaches for the Stingrays, while ruck/forward Sarah Kendall and the lightning-quick Mikala Cann are others that stood out in round one and will be keen to follow-on in round two. For the Stingrays, Shelley Heath was the best in round one and she has been named on the ball for round two, hoping to team up with captain Jordyn Allen, and Isabella Shannon in the midfield. Samantha Ryan was well-held in round one, but could still be a danger up forward, while Lucinda Cripps will lead the defence from centre-half back. In the second game at Healesville, Sandringham Dragons face Oakleigh Chargers, a side fresh off its first win in the TAC Cup Girls competition. Sandringham went down to a strong Geelong outfit, but not without a fight, while the Chargers dominated for three quarters against Gippsland Power to secure top spot on the ladder after one round. The sides did face off in the pre-season with Sandringham coming out winners, whether that occurs tomorrow is yet to be seen. Sandringham’s half-back line looks strong with Winnie Laing and Sarah Hartwig among the best in the Dragons’ round-one loss. The Dragons midfield is also strong, with Jemma Owen, Abbie McKay and 15 year-old Eliza McNamara likely to try and control the ball through the corridor, while up forward, Maddi Wilson and Holly Bate will try and provide the firepower requited. For Oakleigh, the Chargers midfield was very impressive in round one, with Hannah McLaren, Gemma Lagioia, Katie Lynch and Melanie Burtuna all impressing both through the centre and up forward. 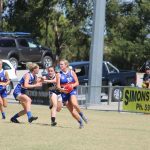 Daisy Bateman and Jasmine D’Amato were damaging inside 50, while Emily Harley provided plenty of rebound off half-back, intercepting plenty of Power forward thrusts. Two sides that were ultra-impressive in round one were the Bendigo Pioneers and Murray Bushrangers who both secured strong victories. Bendigo will play its second consecutive game at Epsom Huntly Reserve, after coming away with a big win over Western Jets. For Murray, round one was an ominous warning to its rivals, easily defeating reigning premiers Calder Cannons, albeit with the Cannons two players down in the last quarter. Bendigo will look to Kodi Jacques in the midfield to get things moving, teaming up with captain Megan Williamson. Up forward, Sophie Kerridge will play at full-forward after a three-goal effort in round one. Along side her, Shelby Knoll will look to be a target, while Maeve Tupper and Brooke Hards – both 15 year-olds – will provide the ground support. Murray had no shortage of contributors in its big victory, with captain Rebecca Webster dominating through the midfield, racking up clearances and ensuring her team kept its momentum rolling. In defence, Grace Egan rebounded everything off centre-half back. Alongside her was Eloise Ashley-Cooper, while up forward, tall target Sophie Damon and small forward Julia Harvey teamed up well to dominate the forward 50 arc. Later on Saturday, the two sides yet to record a win in the TAC Cup Girls competition take to the field in Cranbourne from 3pm. In round one, the Western Jets went down to Bendigo Pioneers, while Gippsland Power could not contain Oakleigh Chargers’ firepower. This weekend will give one team a relieving win, in what is expected to be a fantastic clash of developing clubs with a number of talented bottom-age prospects. For the Jets, Isabella Pritchard was impressive off centre-half back and is still 16 years-old, while up the other end, the other Isabella – Isabella Grant – will look to lead the attack. Through the midfield, the Jets will look to Payton-Ani Ozols and Elizabeth Georgiostathis. Caitlyn Greiser is a 19 year-old tall forward who will look to dominate the air with fellow forward Cleo Saxon-Jones. Gippsland will rely on star and co-captain Tyla Hanks through the midfield, with the likes of Leyla Berry and Alana Rippon to provide some support and speed through the centre. In defence, Emily Haeusler was a clean ball user, while Nikia Webber and Julia Redmond will look to steady the attack. Up forward, Jazz Ferguson and Chandra Abrahams will be the main targets, while co-captain Amy Dunn will rotate forward through the ruck. In the first game on Sunday, Geelong Falcons will look to back up their efforts from their round one win over Sandringham Dragons, while the Greater Western Victoria (GWV) Rebels will hope to bounce back from a loss to Eastern Ranges. Both sides are littered with AFLW Academy stars in what is predicted to be a highly entertaining contest. For the Rebels, Georgia Clarke will start at centre-half back after playing forward last week, swapping with Sophie Molan who was the lynchpin in defence against the Ranges. Sophie Van De Heuvel and captain Lauren Butler will provide a strong one-two combo in the midfield, assisted by the likes of Renee Saulitis and Ella Bibby. Geelong has a star-studded midfield of Olivia Purcell, Nina Morrison and Sophie Walmsley, with AFL Draft Central Player of the Week, Zoe Inei, giving the Falcons midfielders first touch at the stoppages. In defence, Lucy McEvoy will team up with Denby Taylor after the former played inside 50 against the Dragons, while Sachi DeGiacomi will hope to continue her strong efforts leading up in attack. In the final game of the round two action, Calder Cannons will hope to bounce back in front of a home crowd against an impressive Northern Knights outfit. The Cannons were the walking wounded against Murray Bushrangers in round one, but have pulled up well with a week off, while the Knights pulled away from the Stingrays in the final term to celebrate a good win at Beaconsfield. 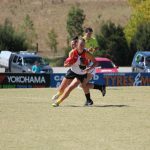 Calder’s midfield is its strength, with Madison Prespakis, Georgia Patrikios and Faith Holloway likely to run all day long, while Molly Warburton will provide some much-needed run off half-back. Others to keep an eye on include Felicity Theodore up forward, after she recovered from an ankle injury, and Eleanor Cornish who will come off the bench to have an impact. Northern have enough firepower up forward to match Calder, led by four-goal hero Alyssa Bannan, and classy forward Alex Pronesti. Nell Morris-Dalton will be a tall target coming out of the square, with the Knights’ midfield of captain Maddy Brancatisano, Britney Gutknecht and bottom-age star Gabby Newton likely to go head-to-head with the impressive Cannons on-ball brigade. THE opening round of the TAC Cup Girls competition had it all. Draft prospects kick-started their season in a big way, debutants shone on the big stage, and while one team enjoyed their first win, another endured their first loss. The Oakleigh Chargers’ first win was a big one, as they sit on the top of the ladder after one round of action. Meanwhile for the Cannons, they sit unfamiliarly towards the bottom of the ladder, after being defeated by the Murray Bushrangers at Yarrawonga. The AFL Draft Central scouts were able to attend four games this week, and we took detailed notes on who we thought were the standouts in each game. So composed in the back-line, and was able to take a mark running back with the flight of the ball. Laid some great tackles in the second quarter especially, when Sandringham was putting the Falcons under the pump. Her speed was a factor in defence, particularly when she chased down and tackled a Dragons forward. This really changed the momentum of the game, as Sandringham was pushing the Geelong defence. Taylor was able to clear the ball out quickly at multiple times, thanks to her quick thinking and quick hands. Love’s acceleration stood out on the day, as she was able to get away from her opponent when they were attempting to lay a tackle on her. She was able to move the ball quickly and well. Her run and carry off half-back was exceptional, nobody could stop her. She not only made some great defensive efforts, but she was able to run into the middle of the ground and make an impact. One of the fastest players on the ground that was able to stand up at multiple times throughout the game. Inei did all the hard work in the ruck, but her impact was felt more so around the ground. Showed great intent to chase down players, especially in the middle of the ground, where the ball was won and lost. Was able to clear the ball into space, allowing her teammates to run onto the ball and execute a running style of footy that proved successful. Got plenty of the ball in the middle of the ground where it mattered. Simply monstered through her opponents, with her aggression and size. A massive force across the ground that helped the Falcons penetrate the ball into their forward line. Great speed out of the pack and in the middle of the ground. Good tackling and run-down chasing was evident early, and only improved throughout the game. Was able to take a great mark while her opponent pushed her under the ball, showing her strength in the contest. Quick thinker, and used her footy smarts to hack the ball onto her boot and clear it into space. Morrison was always zipping around the contest, and was able to chase down players of any size especially in the heart of the contest. Did well to accelerate away from the Dragons midfielders at multiple times. Played a great role down forward, not only kicking goals but providing plenty of assists. DeGiacomi was able to kick the ball right onto the chest of Lucy McEvoy at multiple times, and both combined for some great highlights in the forward line. To me, she was the link in the chain in the forward 50, getting plenty of score involvements throughout the afternoon. She had quick hands and quick feet, particularly when she elected to kick the ball off the ground to move it deeper into the forward line. Displayed good strength to break away from the play and push away two players while running into goal. Ended up with three majors herself- a reward for a good day inside 50. Sheppard’s endurance was the most impressive on the ground. She was able to cover all areas of the ground, despite playing in the forward pocket. Was able to accumulate a lot of the footy in the back-line, and executed some great kicks under pressure. At one point, she was wrestled off the ball but kept her feet, showing her great core strength. Purcell started off her day with a strong tackle in the middle of the ground, and from then I just knew she was going to be unstoppable. Tackling was on-show all day, and to me she looked like a mini Ebony Marinoff! Always put her head over the footy, and got it out of the contest, whether it was a kick, handball or a simple tap. Was able to follow up on her efforts around the ground. She dropped a mark, then quickly picked the ball up and kicked it around her body. Great run and carry off half-back. Was able to back herself and clear the ball into space. Evident in the third quarter when she backed her speed, took a few bounces and sent the ball into the middle of the ground. Was able to take plenty of great marks, and stood tall in the defensive 50 multiple times. The Geelong captain worked extremely well with Sachi DeGiacomi in the forward 50. Was able to capitalise on some great assists, and slotted in well into her new role up forward. Missed two set shots but was still able to get two majors on the board for her side. Teared it up in the forward line, and will only improve as the season goes on. Kicked a great goal in the first quarter to start off her day. Protected the footy really well when she marked the ball. Had a good day up forward, where she was able to complement the bigger bodies of Lucy McEvoy and Sachi DeGiacomi. Skinner was zipping around the ball deep in the forward line, putting pressure on the Dragons defenders. Laing was able to put her head over the footy in the heart of the contest. Was always around the contest and attacking the ball. She got plenty of the ball through the middle of the ground, and was an integral part of Sandringham’s fight-back late in the game. Used her footy smarts to wrestle the ball from the Geelong midfielders at crucial times throughout the game. McNamara was able to burst out of the pack, especially in the middle of the ground. Was able to fight hard for the ball on numerous occasions, and combine her speed and power to penetrate the ball forward for the Dragons. Worked well with Laing around the contest, and together, they orchestrated the Sandringham fight-back in the midfield. Scrapped in hard for the footy throughout the day. Good clearing kick out of the back line, creating space for her teammates to run onto the ball and penetrate it forward. She even did this in the forward line, when she got a free kick at the top of the 50, and booted it to the goal square. Was able to work towards the front of the ground, highlighting her impressive endurance. Has a long kick for a small player! Was pivotal in the forward line for the Dragons, kicking two of her side’s four majors. Dug in deep for her side when Geelong was starting to take control. Used all of her energy to run onto the footy when it was kicked into space, but was unlucky that two Falcons were there to mop it up. Read the footy really well, particularly when she was delivered a magnificent centering kick from her teammate. Was able to convert in front of goal, and will be able hit the scoreboard frequently throughout the season. Displayed great acceleration out of the back-line. But also did some great work in the middle of the ground. She had quick hands and was able to clear the ball out of congestion. Her endurance was fantastic. Was able to kick the ball into space plenty of times throughout the match. What impressed me most was that she kept running after she kicked the ball, following up on every effort she performed on the ground. Broke through the contest with some impressive clearances. Her strength in the contest was very impressive, and was one of the stars in the middle of the ground. Managed to kick the ball into the right area at multiple times throughout the game. Her ability to find space was remarkable, and she was able to use it to advantage to get her team forward. Tried hard in the ruck against Geelong’s Zoe Inei. Got the ball down to her midfielders plenty of times. Has a great leap that could be damaging against the smaller sides of the competition. Heath played in defence and up until three quarter time was best on ground in my opinion, despite her team losing. She started strongly with a great run-down tackle at half-forward and set the tone for the rest of her teammates. She stopped a certain goal with an outreached hand on the goal line and produced some of the best defensive pressure on the field. Heath not only showed defensive attributes, but was strong offensively, running down the wing and breaking the game open. She also was proactive in defence, rebounding nearly everything that came her way, absorbing Northern’s pressure like a sponge. She teamed up well with captain Jordyn Allen, who was often on the receiving end of Heath’s rebounds. Jones was not a huge possession winner, but she was one I was interested to watch given the high wraps on her heading into the match. In the few glimpses I saw, I was impressed with her composure under pressure and her ability to weigh up her options before disposing of the football. She kicked out on occasion early on and that gives an indication of the expectations placed upon her kicking skills. The Dandenong Stingrays’ captain was everywhere and certainly one of the best. She is a strong overhead mark, intercepts nearly anything that comes her way, and she opens up the game for her teammates. Her vision and ability to see teammates before they have even seen her is a real asset to her game. She loves to fend off players and almost always tries to spin out of trouble. I did notice a couple of times she spun to a left-dominant side yet still kicked with her right foot, so this is something that she might work on over time. Sometimes she can over kick the ball a little, but on most occasions she puts the ball into space to demand a teammate to run onto it. Overall a really impressive game. I was quite impressed with Shannon’s game up forward. She moves well and snapped a couple of goals at important times when the game was in the Knights’ favour. She also moved up the ground and won possessions in the midfield and she just has that knack of moving smoothly through traffic. She is a hunter of the football just getting to every contest she could and having eyes for the ball. At times her disposal could be tidied up a little, but as an inside midfielder/forward she certainly stood out. The Stingrays’ full-back was a rock of consistency. She is strong one-on-one, rarely gets beaten overhead and is a reliable kick by foot. At times under pressure her disposal by hand was not as clean, but her defensive attributes, particularly one-on-one and the one percenters were a joy to watch and she could be one to keep an eye on throughout the season. Laid a great tackle in the second half to earn a free kick. Produced a great smother on the goal line to stop a certain goal. I was impressed with her clean hands off a volley from the deck and turned around to dispose of it cleanly. Another player who worked hard to stop a certain goal in the second term. Was quiet early but took a huge contested grab in the final term which indicates there’s a lot more to come from her this season. The Northern Knights captain is a pure inside midfielder who just crashes into the contest with no regard for her own safety. She lays fierce tackles and does all the right one percenters to assist her teammates and bring them into the game. Her first touch could improve, but her inside work burrowing under packs and forcing the ball free really adds a strong dimension to the Knights’ inside brigade. At three quarter time I thought she had been a really solid contributor. Three minutes later she was best on ground. Bannan booted three goals in the opening few minutes of the final term and broke the game open, shutting the door on any chance of a Stingrays revival. It is hard not to award her best on ground honours purely for that three minute purple patch as it won Northern the game. But it was not just her last quarter heroics that impressed me. Earlier on in the first quarter, she showed fantastic composure to pick up the ball cleanly, take a bounce running inside 50 and then take a shot on the run from 20m out. The lightly-framed Bennett is a quick thinker with good skills. She played through the midfield and up forward, using pinpoint kicking to hit up targets over short distances. When inside 50, she positioned herself well under the drop zone and protected the ball making it hard for opponents to spoil. Her hard work to get into space paid off in the last term when she capped off her performance with a goal. One of the better Knights on the day for sure. The top star for mine from the Knights. She was the one I was most interested to see given the high wraps around the bottom-age star and she did not disappoint. I do not use the word lightly, but she has “elite” hands in traffic, reminding a bit of Matt Crouch when he was playing at the Rebels a few years ago. Newton seems to slot in everywhere, but she is a really balanced player, both offensively and defensively and that player you can use in transition. She even spent time in the ruck, winning a clean hitout to a teammate. Her tackling is immense, laying a number of bone-crunching tackles, so I think inside midfield is the way to go, with stints up forward where she could hit the scoreboard as well. Pronesti did not win as much of the footy as her teammates, playing up forward in a strong team effort, but when she did, she did not waste a disposal. She became the first goal kicker in the team for the season, using great composure to sidestep an opponent, straighten up and goal from 30 metres out. She just has the air of class and she does not need to win a heap of the football to have a damaging influence on the contest. Really strong overhead, became a target up forward early and took a good contested mark. Her shot on goal missed, but she has a good presence there. Took the game on at one stage coming out of defence, was caught and pinged but earned the trust back with a smother from the resulting free kick. Had a few very nice highlights coming out of the middle, using great speed and agility to boot the ball forward. Showed a good sidestep out of traffic in defence and her agility shone. The AFLW Academy member had no trouble exerting her influence on the game and was one of the more consistent four-quarter performers on the day. Woods’ strengths lie in her ability to cover ground and do all the defensive things right. She tackles, lays bumps, sets up her teammates and is really strong one-on-one. This strength was emphasised late in the game when she took a huge contested mark at half-back. She just kept popping up around the ground and if you tracked her distance covered, it would be considerably high. A few times her kicks would be a little errant, but as an overall game she was certainly one of the better performers in a good team effort. Another player who I had heard big wraps about crossing from an athletics background, and did not disappoint. I expected the speed and athleticism, but Cann also provided plenty of defensive pressure as well, laying a number of strong tackles. In close, Cann was really strong with clean hands and danced around opponents as if she was working in a telephone box. Managed to save a certain goal with a touch on the line too. Cann also showed off her great acceleration in the third term, burning off opponents by sprinting away from the centre stoppage. Later on she sprinted forward, grabbed the ball off the deck, snapped but just missed. A top performer on the day. Brown is one player who really caught my eye on the weekend because of her super speed and agility. The amount of times she tucked the ball under her arm and put on the afterburners and just left players in her dust was quite phenomenal. In one passage of play later in the game, she sidestepped a couple of opponents, weaved through traffic, straightened up and hit-up a target inside 50. She also sold a fair bit of candy on the day, showing she has confidence in spades and it is no surprise given she is the daughter of Collingwood legend Gavin Brown, and brother to Collingwood-listed pair Callum and Tyler Brown. One of the players that just picked up where she left off last year – as a damaging rebound defender. Macpherson started her day playing on opposing AFLW Academy member Georgia Clarke, but played on a multitude of opponents, moving from half-back to a wing at times. She is one of the best marks in the competition, rarely beaten one-on-one and rarely dropping the pill in the air. She is also a really strong kick and hits up targets over short, medium or long distances. To go with this, Macpherson also has top vision and can open up the play with her decision making. In one instance she actually tried to make a play happen before her teammates were ready and the ball was intercepted given Clarke read the play first, but more often than not she was able to really get the run going from half-back. An instance that was one of the plays of the day was in the final term, where she intercepted a ball in front of her at half-back, received a shepherd from a teammate and did not break stride as she sprinted down the wing, producing a pinpoint kick to her teammate. One player who I thought covered a fair bit of ground and was one of the better performers on the day was Sarah Kendall. She seemed to slot into defence, midfield and up forward because of her ability to stand tall in a marking contest and clunk a grab. Kendall is a booming kick and as the game went on it seemed to improve in terms of accuracy and depth. She had a couple of kicks early clearing the area, then showed that she can size up her options with more time and space. When forward she was a clear target, taking a few grabs and being the figurehead inside the forward 50. In one instance she tucked the ball under her arm and at full speed, managed to find a target up forward. I liked her defensive ability one-on-one, winning a number of crucial contests. She did not win a heap of it, but used her speed to set up a goal and her attack on the ball inside forward 50 was a real highlight. The Ranges’ multiple goal-scorer is a good focal point up forward. She leads to the hole inside forward 50 and protects the drop zone to mark in front of her opponent. She kicked a couple and earned them because of her smarts around goal. Like Taverna, booted two goals but both came in the first term., She worked incredibly hard sprinting from the midfield to run onto the ball and kick the opening goal of the game, then kicked another inside 50 shortly after. Proven was a bit rushed in her field kicking, but strong overhead and strong standing up in a tackle to get her hands free. The GWV Rebels captain was consistent throughout the match, playing her part through the midfield and down back. She is composed with the ball in hand, a trait which shone when under pressure. Butler weighed up her options before disposing of the football and did not put a foot wrong. There were others who might have stood out more, but defensively Butler was a star, laying quite a few tackles to keep the opposition guessing every time they were nearby. One of three AFLW Academy members, Van De Heuvel started slowly for mine but worked her way into being one of the better players on the day. She played up forward a bit and then through the midfield, with a knack of positioning herself well, taking a strong mark and then using her foot skills to hurt opposing players. She is one of the better kicks in the competition and she has that vision to hit up teammates who might be running laterally, mixing things up and keeping the game flowing rather than stop-starting or predictably kicking long. Given how she finished the game, particularly in the third term, it will be great to see how she follows on from this performance with the round one cobwebs out of the way. The midfielder caught my eye early reading the ball off the first hit-out and taking a first few quick steps before kicking long inside 50. Henson has clean hands and works hard to win the footy, while also taking the game on. In one instance she picked up the ball on the wing, had a run and used her composure to deliver the ball well inside forward 50. Another player who might sneak under opposition guard given her highly regarded teammates, but certainly is capable of doing some damage. Molan’s work at full-back was really impressive. Her key attributes are her strength and ability to position herself well one-on-one, rarely losing a contest. In one scenario she was on the wrong side of her opponent (because an opposition player had naturally kicked to direct opposition’s favour), but she worked hard to reposition herself and get a fist on it, then back up with a rebound to clear for her side. Additionally, her rebounding and disposal by foot was quite good and she consistently applied pressure in the defensive 50. Heading into the match, I suspected she might be the one to watch given the high wraps and she lived up to expectations. She is a really smart player who anticipates situations before they happen and is a key link in the Rebels’ transition movement. Clarke is someone who ideally would play forward because of her contested marking, positioning and ability to read the play. But you get the feeling she will also spend a fair bit of time through the midfield in order to open the game up and use her good foot skills to advantage. She seems like a player who is constantly switched on, intercepting a pass inside forward 50 and then having the smarts to deliver the short pass to an open teammate in the pocket. Hardly put a foot wrong all day. Her football skills were off, but her acceleration and agility was bordering on unbelievable. She would grab the ball and seemingly glide past multiple players without them laying a hand on her at times. If she can sharpen up her disposal, she has the athletic tools to be a wildcard in the team. Worked really hard, running on inside forward 50 and kicking a good goal. For a taller player, Harris’ agility and turning circle was quite impressive. I was ultra impressed with Haeusler’s game because for mine, she was the next best after Tyla Hanks for the Power. The reason being, while others might win more of the ball, each time I saw her dispose of it, she used it really well. More importantly, she was able to dispose of it under pressure, both by hand or foot. The attributes she showed certainly suggested there’s talent there and she also has that defensive side to her game, laying a number of fierce tackles and burrowing in defensively. It just means she can play inside or outside and hit targets regardless of her role or pressure she might be under. Abrahams’ positioning seems to be her greatest strength because she played at half-forward and positioned herself well to protect the ball drop. One-on-one she is solid and clearly has smarts in that area, so will be good to see how she progresses through the season. Playing up forward she did not get a heap of looks, but presented on multiple occasions which was promising for a leading forward. A reliable defensive effort from Webber who held her own more often than not. One-on-one she is strong and took a really good defensive mark going back with the flight. Along with her strength and good one-on-one body work, Webber showed a high work rate by her efforts at the defensive end. She was one of the better and more consistent Power players on the day and certainly helped stall the Chargers’ attack somewhat. The clear standout for Gippsland and it’s no surprise why the Power co-captain is one player who will be carefully watched by clubs over the course of the year. Hanks might only be 158cm, but she has impressive offensive and defensive attributes. She has a huge work rate which sees her win possessions in each third of the ground, primarily playing as an inside midfielder. She is a reliable kick of the football, but her greatest strength is her quick hands and smart thinking which can release a teammate on the outside. She often looks for the give-and-go, trying to break open the game from half-back or along the wing. More often than not, Hanks just willed herself to the contest and it was clear the opposition was aware of her influence, keeping an eye on her throughout the match. She intercepted a number of Oakleigh attacking movements and got the ball back on her terms. No doubt she is the kind of player Gippsland would love to have in spades because she just produces over four quarters. Ferguson played in the ruck and off half-back and battled hard throughout the game. She is not as quick as others, but she is strong and looked to break the game open through brute strength and fend-offs. While she might not have been considered one of the best on the day, you could see there is a bit to work with there, and having not come from a footballing background, there were at least some promising signs. She always had a crack and had a few extra smarts, which included a couple of deft taps forward when she knew she was unable to take possession cleanly. In one instance, Ferguson charged off half-back, won the ball and and hit up a target through the midfield. I felt she got better as the game went on, which is something to look forward to in future games. Laid some good tackles and earned a free kick for going in hard. Copped a couple of hard knocks later in the game, but worked into the match well, laying a goal-saving tackle in the final term. Positioned herself well in marking contests and showed good running through the middle. Had a real glimpse of her speed with the athletics state medallist racing away from a contest. On multiple occasions Van Berkel showed super quick hands in close, which was promising. Took a strong mark in the second quarter and kicked the Power’s only goal. Also performed admirably in the ruck, often against taller opponents. Took a few strong goal-saving marks in defence. McLaren started the day as an inside midfielder, progressed up forward and then settled into the defence. She showed off her versatility and ability to play anywhere, in particular her strength both above her head and at ground level. She has a tendency to clunk a mark and continue her motion moving forward, which can unsettle the opposition because of her ability to not let them break and set up defensively. At half-forward, McLaren took a strong overhead mark and looked a lively target, while in defence, she read the play well and timed her leads right to either spoil or clunk a contested mark in front of her opponent. In one instance she took the grab, kept running but unfortunately got pinged for holding the ball. Sometimes she rushes her kicks a little, but the endeavour and her play-reading ability is certainly there. A solid rock in defence. She was rarely beaten one-on-one and just took intercept mark after intercept mark, backing back into the contest and playing her opponent under the ball to put herself in best position to mark. In one instance she marked on the goal line to stop a Gippsland goal and cleared it back out of the defensive 50. Along with her marking, her body work and ability to back herself coming out of defence was good. Lagioia is a player I had not heard much about coming into the match, but for me she was the most damaging midfielder for the Chargers. It is a big call, but she might be one of the best kicks in the TAC Cup competition, with her ability to not only penetrate over long distances, but spear a pass to a leading forward. The amount of times she teamed up with Daisy Bateman to impact the scoreboard was amazing. Along with her elite foot skills, she is really good one-on-one in the air and also brings her teammates into the match. In one instance deep inside her forward 50, Lagioia was under pressure and allowed a couple of opponents to come at her so she could time a handball to release Melanie Burtuna on the outside to snap a goal. A real talent here. The star up forward who is equally athletically talented as she is skilful. She booted a couple of goals in the first term, including an amazing goal from the boundary line, then proceeded to be the most damaging forward on the field. She won a one-on-one against a bigger defender, showing off her strength and more important, balance, in the contest. Bateman also has super acceleration and agility which was seen by her ability to back herself against an opponent hugged up against the boundary line, weave around them and sprint into the corridor leaving them in her wake. Not only did she crumb, but she lead up at teammates and just ran into the open space which her teammates honoured her leads. Bateman set up Melanie Burtuna with a goal, and had a number of other impressive plays deep inside 50, showing off her good vision and football IQ. A real utility, Lynch covered ground well across the four quarters. Early on she had an attempt on goal which just missed, then marked the kick back out from the opposition defender, negotiated the breeze perfectly and slotted it through the middle. The next stoppage she was in the centre square, won the clearance and sprinted away, showing off some good pace and movement through traffic. Lynch also worked hard throughout the game, got free and found herself all alone in the goal square later on to mark and goal, a reward for her hard running. D’Amato had really good pace and agility, sprinting away from the contest and was one of the Chargers’ better players in the win, linking up the midfield into the forward 50. The dominant ruck on the day, Winbanks towered over her opponents and was effective in her hitouts, with the opposition trying to read it off her hands. She used her strength on a couple of occasions to fend off her opponents and boot the ball forward. The pacy midfielder sprinted away from a stoppage and looked to have set her sights on goal in the first term, but was taken down in a fierce tackle. Another Oakleigh player who covered the ground well and won possessions in all thirds of the ground. She won a crucial hard ball at ground level through the midfield and got the ball moving in the Chargers’ direction, found space inside 50 and took an uncontested mark, and moments later won a free kick inside defensive 50. Burtuna is your stereotypical dangerous small forward. She constantly buzzed around the packs and was rewarded with three goals. Burtuna also set up a goal with a nice lateral kick to Georgia Byrne.